To the South, one hundred and twenty-five years ago. Additionally, it was Tench Tilghman who brought the news of the surrender of General Cornwallis and the British on October 19th, 1781 following their defeat at Yorktown, to Congress. Tilghman, in his journey to notify Congress in Philadelphia, first stopped in Annapolis, Maryland and informed Maryland Governor Thomas Sim Lee of the surrender. However, Governor Lee had already been informed of the news, and as a result, sent the State House messenger, Jonathan Parker, to Philadelphia with the news. But, since those in Philadelphia were used to hearing information in the past that turned out to be rumors, and afraid to celebrate too soon, they waited anxiously for the official word; those dispatches that Tilghman carried. 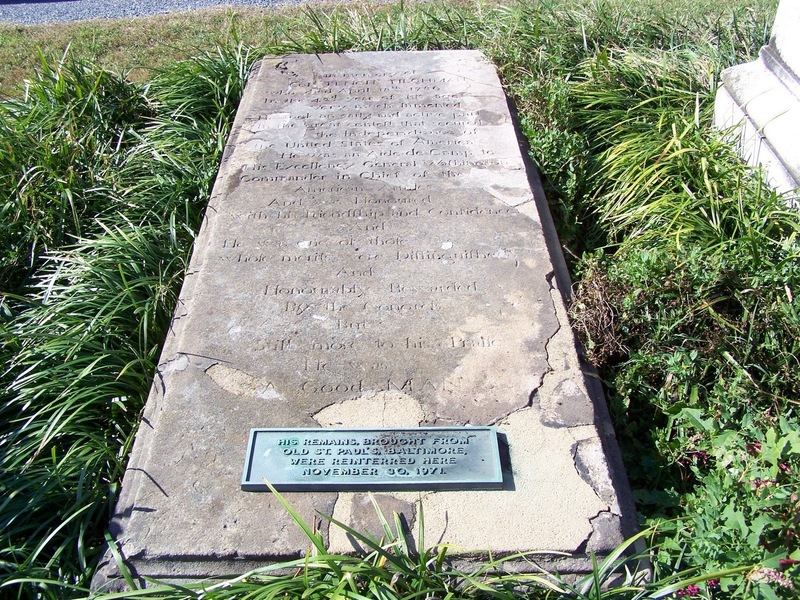 From Annapolis, Tilghman boarded a ferry at Rock Hall, Maryland, and after stopping to rest and see his family, continued on his journey to Philadelphia, arriving on October 24th, 1781. He first delivered the news to the President of Congress, Thomas McKean, then later that afternoon, attired in his full uniform and dress sword, Tench delivered the news to the members of Congress, as well as answered the numerous questions about the Battle of Yorktown. In appreciation for his faithful service, Congress awarded Tilghman a horse and another dress sword. That evening, a celebration by torchlight was held in Philadelphia in honor of Colonel Tilghman and the victory at Yorktown. In preparation for this celebration, the following was written and distributed to those in Philadelphia, saying, "those citizens who chose to illuminate on the Glorious Occasion, will do it this evening at Six, and extinguish their lights at Nine o’clock , and decorum and harmony are earnestly recommended to every Citizen, and a general discountenance to the least appearance of a riot." Tench Tilghman's ride has become somewhat of a legend; therefore, various accounts have been given of his journey between Yorktown and Philadelphia. In some accounts, where that facts are not known, writers have attempted to picture what it must have been like as he crossed the Chesapeake Bay, rode through Kent County, etc. But for this story we will use Esther M. Dole's "Maryland during the American Revolution." "By the terms of the surrender Cornwallis gave up 7,247 regular troops besides 840 sailors. One hundred and six guns were taken. The land forces and stores were assigned to the Americans and the ships and marines to the French who had ably assisted with their fleet. Maryland troops deserve a full share of the honor of this achievement for they have given material aid in the field under Gist and the State had exerted every effort to furnish the necessary supplies for the combined armies to maintain the siege." ON THE surrender of Cornwallis, Col. Tench Tilghman of Maryland, aide-de-camp, was selected by Washington to carry the news to Congress at Philadelphia in the form of an official dispatch. Taking boat in York harbor he went to Annapolis which had received the news the day before from the Count do Grasse. He crossed the bay to Kent County, landing at Rock Hall, where he found a horse waiting for him. he then took the old post road to Edesville to Chestertown, thence north to Georgetown where he crossed the Sassafras River. When a horse would tire he would stop at a farmhouse so the account goes, and would shout, 'Cornwallis is taken, a fresh horse for Congress,' and one he would go." He passed through Wilmington, and on to Philadelphia. It took him four days to make this memorable trip, and he arrived at midnight Oct. 23, 1781. He knocked on the door of Thomas McKean's house (the President of the Continental Congress) told him of the glad tidings. Soon watchmen throughout the city were proclaiming the hour and shouting "All is well and Cornwallis taken." Within minutes most of the citizens were awake and in the streets celebrating the happy news. The State House bell rang out "Liberty" for the new American nation. ...Of more interest to us was the celebration that took place on Oct. 22, after Tench Tilghman rode into Chestertown. "This great event was no sooner announced to the public, than a large number of worthy citizens assembled, to celebrate the signal victory, (in a high degree auspicious to the cause of freedom and virtue) which was done with a decency and dignity becoming firm patriots, liberal citizens, and prudent members of the community-amidst the roaring of cannon, and the exhibition of bonfires, illumination, et., the gentlemen (having repaired to a hall suitable for the purpose) Drank the following toast, viz., 1. 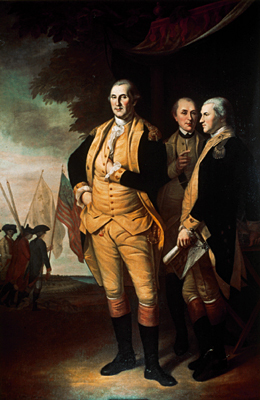 General Washington and the Allied Army; 2. Count de Grasse, and the Navy of France; 3. Congress; 4. Louis the 16th; a friend to the Rights of Mankind; 5. The United States; 6. General Greene and the Southern Army; 7. Count de Rochambeau; 8. The Memory of the illustrious Heroes who have fallen in the defense of American liberty; 9. King of Spain; 10. The United Provinces; 11. The Marquis de la Fayett; 12. The northern Arm; 13. The State of Maryland-the last in order but not the last in Love." Tench Tilghman, one of Maryland's great patriots, was born on December 25, 1744 in Talbot County on his father's plantation. He was educated privately until the age of 14, when he went to Philadelphia to live with his grandfather, Tench Francis. In 1761, he graduated from the College and Academy of Philadelphia, which later became the University of Pennsylvania, and then went into business with his uncle Tench Francis, Jr. until just before the Revolutionary War. After the War, Tilghman returned to Maryland where he resumed his career in business in Baltimore and married his cousin, Anna Marie Tilghman. They had two daughters, Anna Margaretta and Elizabeth Tench. Tilghman died on April 18, 1786 at the age of 41. As there were few man for whom I had a warmer friendship or greater regard for your brother Colonel Tilghman—when living; so, with much truth I can assure you that there are whose death I could have more sincerely regretted—And I pray you and his numerous friends to permit me to mingle my sorrows with theirs on this unexpected and melancholy occasion. June 5, 1786 ...none could have felt his death with more regard than I did, because no one entertained a higher opinion of his worth. Gosh, talk about republican austerity! A British officer carrying to the King a dispatch of such a momentous victory would at least get a promotion out of the deal. A sword and a horse. Well, the Founding Fathers were frugal. Would that the Congress today was so parsimonious with public money. Truly! But Tench did not need much else, since he came from one of the wealthiest families in Talbot County, Maryland. I thought he was promoted from Lt. Colonel to full Colonel, but perhaps that happened at a different time. Lila Rose: Is She Lying?